It's beginning to look a lot like...Patreonmas?! Tis the season for giving and this year I'm going all out! 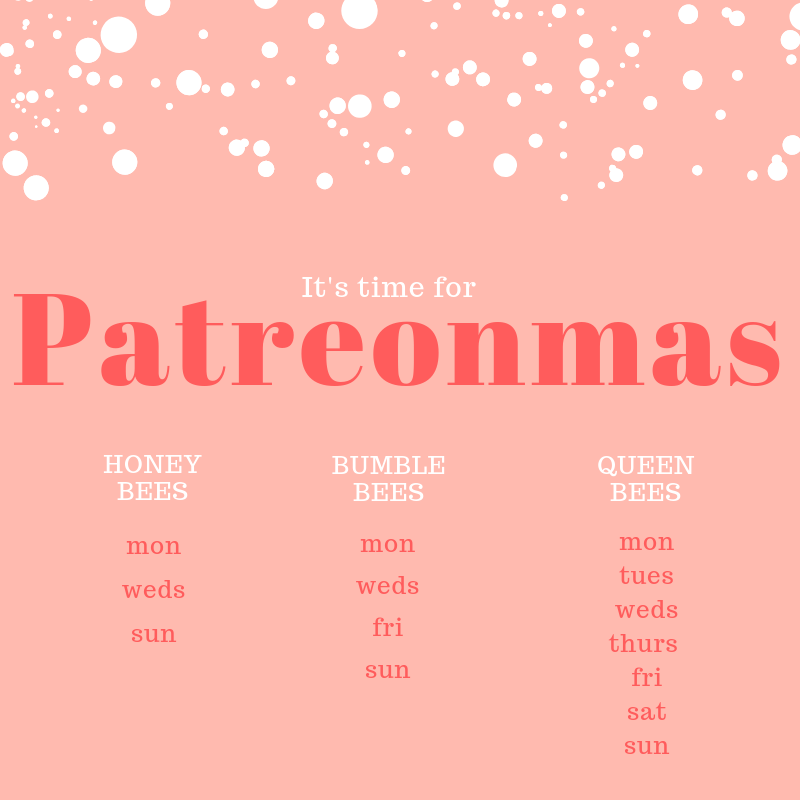 Patrons in the three top tiers on Patreon will all get access to extra exclusive content throughout December as my way of saying thank you. Honeybees [£3.50/$5] will have access to three posts a week: Mon, Weds & Sun. Bumblebees [£4.93/$7] will get access to four posts a week: Mon, Weds, Fri & Sun. Queen Bees [£6.33/$9] will get exclusive posts every single day of the week. What sort of content can patrons expect? I'm still planning my posts, so there's still time to make requests, but you can expect everything from a brand new episode of my brand new low-key 'podcast' to the next edition of the Creative Guide. New patrons will, of course, also have access to 7 months of past posts from their chosen tier! From my bookshelf tour videos to the monthly writing exercises, from the audio discussions to the original poetry, you'll have access to a whole host of posts! The tiers will give you access to more than just the exclusive extra content too. There's the Instagram community, the weekly promo and positivity thread and more where that came from for you to sink your teeth into! If you've been meaning to sign up, now could be the perfect time to do just that! If you have any questions, drop me an email or a message on Twitter! A small selection of the past Patreon posts have been made public for your perusal. Here's a handy little list of them for you all to read through! We're looking forward to welcoming you to the coven. Shout out to my existing patrons for their support and everything they bring to the community: Michelle, Ella, Gem, Fern, Sian, Lauren, Lyzi, Amy, Caitlin, Georgia, Lauren, Chelsea and Eileen. Did you catch my post on 100 Christmas Gift Ideas the other day? I've tried to consider a wide selection of people with varying budgets and abilities.